As I first started reading Halflings, I was a bit confused about what it was talking about. But guess what? It's about fallen angels, who are called Halflings, or "The Lost Boys". The protagonist, Nikki, isn't a halfling. 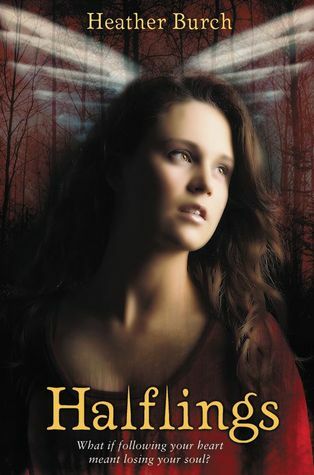 Three boys, who are halflings, are sent to protect her from the bad side. The three halflings are Mace, Raven, and Vine, whom I adore. The thing that really gets you hooked, is the suspense in the story. I don't know why these bad guys want Nikki. Why her, when she's just a normal human being? I really enjoyed reading this book because all the characters were awesome. Nikki has a black belt in karate, so she's not weak, and doesn't need a "guy" to protect her. I liked how she was smart, and how she put the pieces together of what's happening around her. Mace, Raven, and Vine are so cute together. I loved how there was a 15 year old kid (Vine). They were all caring towards Nikki, and none of them were lazy. I also really loved their brotherhood towards each other. How nothing can break them apart or cause hatred. Halflings was a very interesting read! Its a debut novel, so I want to give a big clap to Heather Burch for writing an amazing story! Can't wait for the sequel! I'm really glad to hear you enjoyed this! I got it from Netgalley too but I've been a bit undecided about reading it. I'll have to get to it soon! I really liked this book, too! Very glad that you enjoyed it. Thank you so much, Farah for the fabulous review!